Lent and the Saints! Join us as We Celebrate Both! Dear Parishioners: I thank those parishioners who have pledged their generous support to the Catholic Charity Appeal. With 191 parish families donating thus far we have raised $70,547.50 towards our parish goal of $193,000! It’s a great start to reaching our goal this year! If you have not yet made a pledge to the Catholic Charity Appeal, I ask you to consider to please doing so. We are asking every parish family to make a pledge of $300. This is $30 a month over 10 months or less than a dollar a day! Your support helps the Diocese of Providence to help the poor and the needy through her good works. I thank you for your generous support! Last week I wrote about alms-giving as pillar of Lent. This week we consider the pillar of prayer. More time given to prayer during Lent is meant to draw us closer to the Lord. We might pray especially for the grace to live out our baptismal promises more fully and faithfully. We might pray for those joining our Church this coming Easter. We might pray that more might turn to the Sacrament of Confession during Lent that they will be truly renewed by God’s love and mercy. During Lent there are many ways to pray more if only we make the time and sacrifice to do so. Each Friday we can prayerfully walk the Stations of the Cross at 7:00pm. The Stations of the Cross began as the practice of pious pilgrims to Jerusalem who would retrace the final journey of Jesus Christ to Calvary. Later, for the many who wanted to pass along the same route, but could not make the trip to Jerusalem, a practice developed that eventually took the form of the fourteen stations currently found in every Catholic Church. Join us on Fridays to prayerfully make the Stations of the Cross. There are two daily masses at OLM during Lent, 7:30am and 12:05pm. Try to attend Daily Mass during the week. The Eucharist is the truly the best way that we have to pray. Adding more prayer to your daily routine in Lent can help deepen your faith and strengthen your relationship with the Lord. Also I encourage you to mark your calendar for the Lenten Mission at OLM. Fr. Chris O’Connor, a priest from Boston who serves as the Vice-Rector at St. John’s Seminary there, will be leading us on Mission from March 25 through 29. The theme for the Mission is “Helps for the Journey.” Each night of the Mission Fr. O’Connor will speak and there will be the opportunity for Confession. This is another great way to deepen your faith and strengthen your prayer life. Speaking of calendars, don’t forget to add some great events coming this week. On Friday we celebrate St. Patrick’s Day with a Mass at 12:05pm. Bishop Evans is to celebrate the Mass and Fr. David Cavanagh is the homilist. It will feature readings in Irish along with hymns from Ireland!! Bishop Tobin has most graciously granted a dispensation from the rule of abstinence from meat for March 17th! The Bishop writes: “This year, St. Patrick’s Day (March 17) falls on a Friday during Lent. On this specific occasion, in light of the festive nature of the day, I hereby dispenses Catholics in the Diocese of Providence from the disciplines of fast and abstinence that are normally required on the Fridays of Lent. Catholics who take advantage of this dispensation are reminded that, in maintaining the penitential spirit of the Lenten Season, some other form of penance, prayer, or charitable work should be substituted at an appropriate time.” So you may eat your corned beef and cabbage in good conscience on Friday! 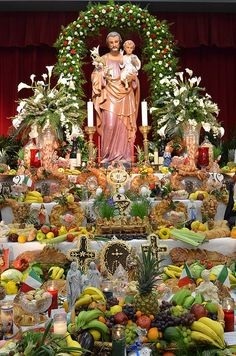 Also St. Joseph’s Day is moved to Monday, March 20 because it falls on a Sunday this year. So we will celebrate St. Joseph’s Day with Mass in Italian celebrated by Fr. Angelo Carusi, the Pastor of St. Rocco Church. The 12:05pm Mass features readings and hymns in Italian. Next Saturday night we celebrate the Irish and the Italians with “Gaelic and Garlic Night.” Join us at the OLM School Cafeteria from 5;00pm until 9:00pm for a night of Italian and Irish music, corned beef sandwiches, pasta and meatballs, and lots of great desserts. We’ll have Irish Step Dancers stopping by and loads of raffles and door prizes! It is a great occasion for us to get together as a parish family and celebrate St. Patrick and St. Joseph! Tickets are being sold after Masses this weekend and are available in the Parish Office. It’s going to be a great family party so be sure to mark it on your calendar and stop by! Enjoy the corned beef on Friday! See you at Gaelic & Garlic Night! Lent is here! Pray! Fast! Give! Thanks for the support of the Catholic Charity Appeal! Be well. Do good. God Bless!